During the week, there are a few breakfast items that are in regular rotation at our house. We need something quick and easy, especially on busy mornings. Toast or an english muffin topped with a little peanut butter and jelly is one of our normal go-to breakfast choices. This bread makes this favorite option of ours even easier. The peanut butter and jelly is already swirled in the bread for you. Score. Over the last year, I’ve slowly become more and more comfortable working with yeast. To be honest, when I first started to really enjoy cooking, yeast was quite intimidating to me. It seemed like so many things could go wrong. Turns out its really not so bad. The more I work with it, the more confident I have become. And that confidence led me to try this bread – swirl and all. To say I was excited that it turned out when I cut into the loaf is an understatement. I may have done a little happy dance around my kitchen. This bread is delicious. Homemade bread with the ever popular combination of peanut butter and jelly. You can’t go wrong with that. As a note of caution, don’t try to put these slices in the toaster. Even though I knew it wouldn’t end well, there was a little voice in my head saying “just do it” and I was kind of curious to see what would happen. So I did. I put two slices in the toaster. Of course a huge mess ensued and I was left trying to quickly clean it up before heading out the door to work. Did I also mention that I was already dressed for the day? My husband came down the stairs to find me standing in my pretty skirt that now had melted peanut butter all over it. Seeing as how I make messes daily, he didn’t even bat an eye. So save yourself some trouble and if you want to eat this bread toasted, just pop the slices in the oven for a few minutes on a baking sheet. Or you can experiment like I did – I won’t judge. 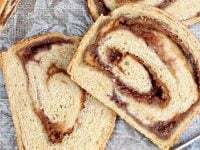 Recipe for peanut butter and jelly swirl bread. Homemade bread with a PB&J swirl! A fun spin on this classic combo! To make the oat mixture: In a small bowl, combine the oats, honey, butter, salt and boiling water. Mix slightly then let sit for 30 minutes, until the oats have softened. Let the mixture cool to room temperature before you proceed. To make the dough: Add the yeast, warm water and honey to the bowl of a stand mixer fitted with the paddle attachment. Mix on low speed for a few seconds just to combine. Add in the cooled oat mixture, whole wheat flour and 1 ½ cups of the all-purpose flour. Mix at low speed until the dough forms a cohesive mass. Stop the mixer and switch to the dough hook. Knead the dough on low speed for about 5 to 8 minutes, until it is smooth and elastic (adding more all-purpose flour if needed to achieve the right texture). Shape the dough into a ball and place in a large lightly oiled bowl. Turn the dough once to coat. Cover with a clean kitchen towel. Let rise for about 1 ½ to 2 hours, until the dough is doubled in size. Press down the dough to deflate and turn out onto a lightly floured surface. Knead the dough gently for about 20 seconds to remove any air bubbles. Roll out the dough into a 10 by 12 inch rectangle. If the dough springs back when you are trying to roll it out into the rectangle, stop and let it rest for about 10 minutes and then try again. Gently spread the peanut butter on top of the dough, leaving a 1-inch border around the edges. Next spread the jelly on top of the peanut butter. Fold the edges over the peanut butter and jelly. Roll the dough tightly into a log, starting with the short end. Lightly grease a 9×5 inch loaf pan. Place the dough into the prepared pan and let rise for about 45 minutes to 1 hour, until the dough has cleared the top of the pan. Preheat your oven to 350 degrees. Bake the dough for 35 to 45 minutes, until golden brown and it sounds hollow when you tap it on the bottom. Let the loaf cool completely before slicing. Barely adapted from Pink Parsley. Originally from King Arthur Flour.